I've seen photos and videos of the Ganges River online and on TV, but I never thought that I would be able to visit this place. The chaos and the ancient way of life were just pictures and videos from some far away land, and now I got the chance to get right in the thick of things. 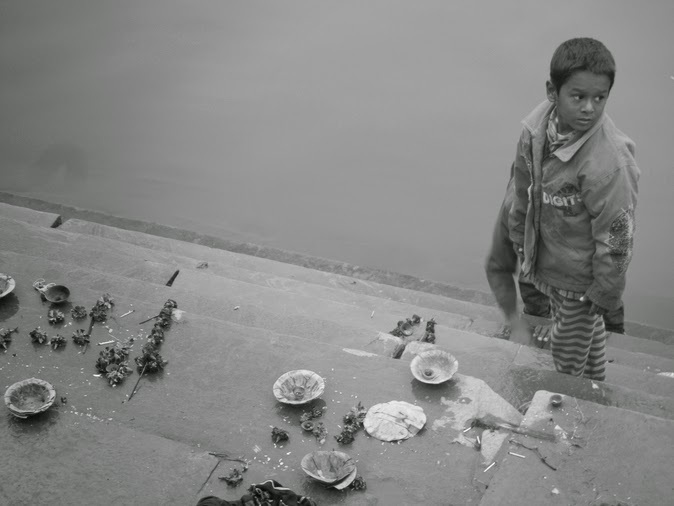 Once you get into the city and the ghats, Varanasi is an attack on the senses...from all angles. Plainly put, it was chaotic but in a good way. It was colder than Kolkata, I felt the cold touch of winter as soon as we disembarked. My friend and I decided to book the sunset tour which included a boat ride in the hostel we were staying in. We wanted to hear what a local has to say about the area, wandering on your own has its perks, but someone giving you insights and funny anecdotes along the way is a plus. The Ganges flows through India and Bangladesh and is the most sacred river to Hindus. The river is worshiped as the goddess Ganga in Hinduism. Aside from being a sacred river, the Ganges is the life blood of many Indians that live along it. A lot of locals were on boats peddling souvenirs and items to leave on the river. Our guide told us that many Indians cremate and leave behind deceased loved ones in or along the river. There are certain types of people that were not allowed to be cremated such as babies and sadhus or holy men. These types of deceased people were tied to heavy rocks and put in the river to sink. Thankfully, I didn't see any corpses along the banks or floating out of the river during my entire stay in Varanasi. Many devout Hindus went to cleanse themselves in the river. Aside from bathing, I saw many people washing their clothes, gargling the water, brushing their teeth, and washing dishes along the banks of the river. Wow. It was a completely different culture, chaotic, disgusting, and beautiful all at the same time. This culture has been around for hundreds of years, still doing some of the things they used to do before the colonizers came. Varanasi is indeed one of the oldest cities in the world. Seeing the cremations take place was surreal. Even the levels at which bodies were cremated had a certain meaning, each tier indicated a person's status in society. There was a cultural show that depicted Hindu gods just before we returned to the hostel. There wasn't much of a sunset because of the thick fog that enveloped the city, but the boat ride was worth it despite the freezing cold. After taking on the sunset tour of the Ganges, I decided to do the same thing again in the wee hours of the morning just to see if there is any difference. The atmosphere was definitely different as soon as we hit the water on our boat. The fog was thicker and the air much colder than the sunset tour. Visibility was limited. But the cold and fog didn't stop these devotees from visiting the river to cleanse themselves and make an offering to their gods. There were local peddlers on their boats trying to sell visitors and devotees offerings. I was told that this was the laundry ghat. Does washing your laundry in the Ganges make it holy? I wonder what these locals think? If it was cold during the sunset trip, it was definitely colder during sunrise. But the weather (probably 5 degrees Celsius, coldest I've experienced) didn't stop these devotees from bathing in the river, in their underwear or very little clothing. Many Hindus trooped to the river and quickly bathed in the water (bone chilling probably) while screaming, it was quite funny. I didn't see the sunrise, but I saw something more, the devotion of the Hindus despite the circumstances. Walking along the ghats was a different experience compared to riding the boat. I got to see Varanasi in a different way. The poverty was obvious, but the devotion was real. Would it matter that you had nothing of the material comforts that most people hold onto? What if all you had was your belief? Some of the structures along the river were transformed into hotels and restaurants. A trip to the Ganges River may enlighten or frighten you with its devotion and poverty, but it's a trip worth making, when you're in North India.